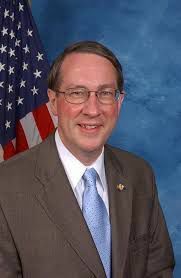 U.S. Rep. Bob Goodlatte, R-Va.
“Members of the House Judiciary Committee had a very informative and productive visit to the Rio Grande Valley Sector of the U.S.-Mexico border,” Goodlatte, chairman of the committee, said in a statement. “I want to commend all of our federal officials on the ground at our southwest border who are working together to secure our border, enforce our immigration laws, and combat human and drug smuggling. The group was briefed at the McAllen Border Patrol station and met with RGV Sector Chief Manuel Padilla. They also toured the Rio Grande by boat and the Hidalgo-Reynosa International Bridge before continuing on to San Diego, California. Members of Congress often visit the Valley, typically as part of a delegation, though Sen. Ted Cruz, R-Texas, usually comes alone, oftentimes a couple visits per year. He has made three Valley visits so far this year. The other Texas Republican, Sen. John Cornyn, has often brought non-Texas colleagues to the border. In February, Cornyn brought Sens. Dean Heller, R-Nev., and Thom Tillis, R-N.C., along with Rep. David Rouzer, R-N.C., as well as a couple Texas members, Reps. John Carter, R-Round Rock, and Mike Conaway, R-Midland. Cornyn has made one other trip to the region so far this year, in April. Groups often visit a border crossing, the Rio Grande and meet with Border Patrol agents, among other stops.